Take advantage of convenient hotel amenities and services at Kahler Inn & Suites to ensure a most accommodating stay in downtown Rochester. Enjoy direct access to the Hotel near Mayo Clinic via climate-controlled pedestrian skyway and underground concourse or complimentary shuttle service to area clinics and St. Mary's Hospital for seamless transitions around the Hotel near Mayo Clinic complex. Start your day with a complimentary hot breakfast, featuring freshly brewed coffee, fresh fruit, eggs, waffles, and juices. 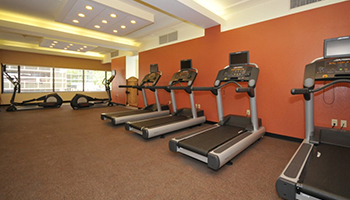 Stay connected with free Wi-Fi and stick to your workout schedule in our state-of-the-art fitness center. Take a dip in the hotel's indoor pool and unwind in the hot tub for ultimate relaxation. Stop in CB3 Burgers & Brews for their signature adult milkshake and handcrafted burger, or sample an ice-cold beer after a long day. To learn more about and to schedule complimentary shuttle service around the Hotel near Mayo Clinic complex, contact us at (507) 285-9200.